I expect you’ve heard of the Rule of Thirds, Diagonals and other compositional tools to help improve your photos. The question is how to you make big solid elements like trees and buildings line up to conform to these compositional tools? I mean you can’t move the horizon can you? Yes you can and it’s really easy too. In my photo the horizon is running through the photo at about waist level. But you can easily move it up or down in the image and put it behind my shoulders or even make it so low down it disappears. In how to compose a photo we'll show you how using the video camera so you actually see the composition change in the viewfinder. This is real life composition management. So many people believe that beautifully composed pictures are a function of expensive cameras, lenses or maybe a menu setting ­ but they’re not. Great compositions live outside the camera and inside your imagination. The trick is knowing how to channel what you’d like an image to look like - out through the camera and into a picture you’re proud of. Remember your camera is only a tool for interpreting what’s around you into a photo. It’s you who has to tell it what to do. After completing the 7 Building Blocks of Photography course I feel more organized when taking pictures. I am now able to think step by step and my photos are looking much better. 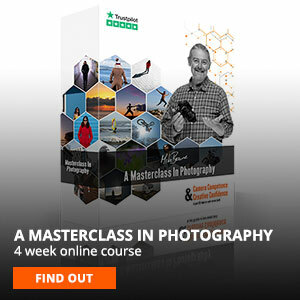 I would recommend The 7 Building Blocks of Photography.